Raiders fans have heard the glowing reports of Marquette King’s athleticism and seen the YouTube video of his booming punts and 5.5 second hang time. But King’s ascension to Raiders’ punter following the release of Shane Lechler this offseason may not be so automatic after all. Recently, the Raiders worked out a pair of NFL veteran punters in Jason Baker and Mat McBriar, and Oakland is considering signing an experienced NFL punter to compete with King for the job this summer in training camp, reported Bill Williamson of ESPN.com. In addition to Baker and McBriar, Chris Kluwe also is looking for a job and would be available. Kluwe, released by the Vikings last week after six seasons, has a 44.4 yard career average. Baker, an 11-year NFL veteran, first punted for the 49ers in 2001 and 2002. He’s also punted for the Eagles, Chiefs, Broncos and Panthers, the team he was with from 2005-2011. He has a 42.7-yard average. 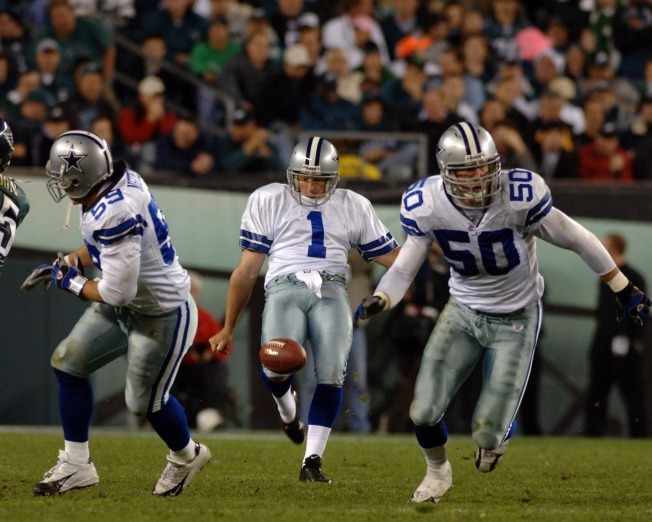 McBriar punted eight seasons for the Dallas Cowboys but spent last year with Philadelphia. He has a career average of 45.4 yards. Lechler, a seven-time Pro Bowler, signed a three-year deal with the Texans after being released by the Raiders in a move to cut salary. That left the door open for King, whom the Raiders signed last April as an undrafted free agent out of Fort Valley State. In workouts for scouts after his college career, King had high-arcing punts of 70 and 80 yards; and in his senior season, he had punts in games of 80 and 76 yards. Sixteen of his 50 punts his final season were for 50 or more yards. In training camp with the Raiders last season he again was impressive with his strong leg, but was inconsistent. When he was injured, the Raiders decided to retain him on injured reserve for the entire season and give him a chance at the job this season. Also in camp this summer will be Bobby Cowan, an undrafted free agent out of Idaho. The left-footed Cowan is the Vandals’ career leader in punting average at 44.7 yards. Raiders head coach Dennis Allen last summer said King was impressive in the limited time he was able to watch him.